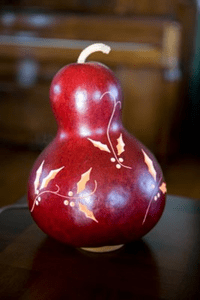 Created by nature and individually crafted, each gourd is one of kind. Made in the U.S.A., each of these gourds (vines growing over 20 feet long) is planted and nurtured, and carefully dried out, awaiting its final destiny. They are painted and carved to bring these delightful tokens of winter to you and your home. Select one or many, grouping them to make your own personal statement!